Lightning Skips is well known for our skip bin hire Acacia Ridge, and for good reason. We have provided quality service at dependable prices to the region for over a year. Lightning Skips have also built strong relationships with our customers in that time. Positive word of mouth is essential to the success of any company. We are happy to say that our clients are glad to sing our praises. 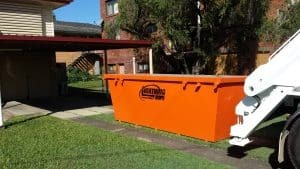 As a trusted name for skip bin hire Acacia Ridge, it is our duty to provide you with nothing but the best. We have receptacles of all sizes (2 – 8 cubic metres) so you can feel confident that we will have the disposal unit to meet your needs. We are always happy to answer questions concerning our skip hire services in Acacia Ridge because we believe that a well-informed client is a satisfied client, and your happiness is our goal. Schedule a delivery with us today. Due to its proximity to the local government district, it is important to keep Acacia Ridge clean of rubbish and other debris, and you can help when you hire a skip bin from Lightning Skips. It can be inconvenient to take your refuse away, which is why we offer skip bin hire at fixed rates. When you come to us, you are guaranteed a reasonable price that will not change based on why you need it. We are the only company in Acacia Ridge able to make that promise. Landscaping and construction work produces a fair amount of trash that needs to be picked up and disposed of properly. When you use our skip bin hire in Acacia Ridge services, you are making waste disposal that much easier; just fill it and wait for pickup. It really is that easy. All you have to do is tell us when you expect delivery, and we will be there without problem or excuses. Punctuality is important in our line of work. The next time you need a company to help with waste management, get in touch with Lightning Skips. We are glad to help. If you want to hire a skip bin in Acacia Ridge, Lightning Skips is the company you want. Our courteous staff members are always happy to answer any questions and address any concerns you might have. You know we strive to provide nothing less than stellar customer service because we want to you to return to us many times in the coming years. We take extreme care in maintaining our containers because we want you to be able to trust that they will meet your needs and expectations. We clean them regularly and check for damage. The last thing we want is for one of our bins to fail you and create an even bigger mess. We have full confidence in every unit we hire out to our clients. For waste receptacles, you can trust, speak with a friendly representative from Lightning Skips. We are confident you will not be disappointed with what we have to offer. You can catch us on 0472 975 477, or fill out our online booking form located on the homepage to get a quote today!